Internationalizing React Apps — A straightforward, easily accessible guide to developing a universal React application with full internationalization support. Using Redux for Managing Immutable State — An accessible code and diagram rich introduction to managing state through action creators, pure functions, composed reducers, and more with Redux. React Table: A Fast and Extendable Datagrid for React — Lightweight at 7KB with fully customizable JSX templating. Demo here. Track errors in your React apps with Sentry — Don’t wait for users to tell you when your gnarly code inevitably breaks. 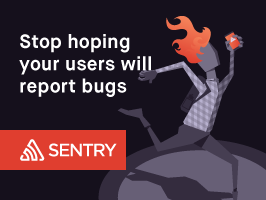 Sentry’s open source error tracking and notifications for React, Node - and every other major language in your stack - will let you know exactly when and where you went wrong. Using Flow to Bring Types to React Components — How to use Flow in terms of React & Redux. React at 60fps — Techniques for optimizing your apps built with React. Quick Development with nwb — nwb lets you quickly run and build code using React, Inferno and Preact, starting from a single .js file without any project setup or configuration. Crop, Resize and Filter Photos Using React and the Filestack API — How to crop, filter, and transform images simply by adding parameters to the image URL with Filestack’s API (an external service). 3 Libraries and 3 Ways to Handle AJAX in React Apps — Some of the methods which you can use to make AJAX calls within your React app. How the NFL Scored a UI Touchdown with React and Node — An interview with NFL Software Engineer James Hush exploring how React and Node.js have shaped the company. 20 minutes. Faster Source Map Generation for React Native — A developer of React Native’s packager explains how they’ve improved source map generation times.